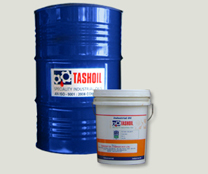 Airtash 32; 68, 100, 150, 220 :: Tashoil Company Pvt. Ltd.
AIRTASH grades have been specially blended from highly refined base stocks with special additives to impart special boundary lubrication features which takes care of broken film even under EP conditions and stick-slip positions, along with special emphasis on rust-prevention. Lower and medium viscosity grades 32; 68, 100, 150, 220, etc., are recommended for slideway lubrication of planner, grinder horizontal boring machines, shapers Jig borers etc., and also manual oiling of gears.